We exclusively reported earlier this year that Samsung is working on an 18.4-inch Android-powered tablet, a few months back the company teased this tablet that it has named the Galaxy View, and over the past couple of weeks there has been a steady stream of information about this new tablet. 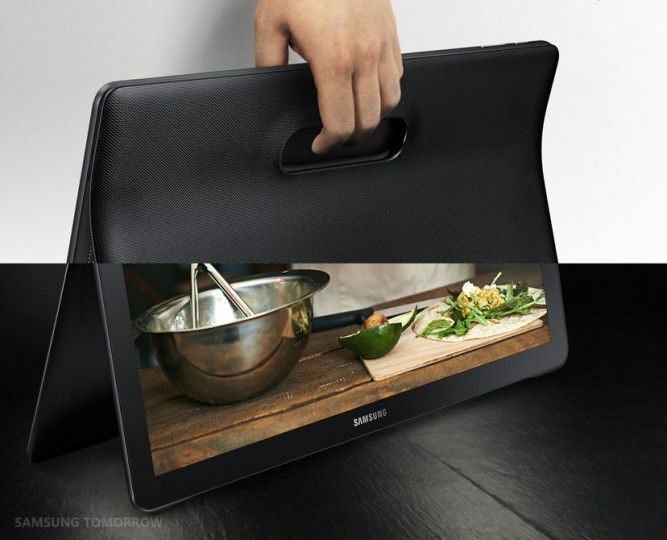 Today Samsung has finally unveiled the Galaxy View, the biggest selling point is its huge display and Samsung promises a video-optimized user interface as well a “long-lasting” battery life. There’s no mistaking the fact that this device has been created with content consumption in media and the display size is just perfect for that. The Galaxy View has an 18.4-inch full HD display, Samsung says that it has been designed with a video-centric interface in mind, there’s a dedicated home screen for videos which showcases all of the different content sources in one place making it much easier for users to discover content they’d want to watch. 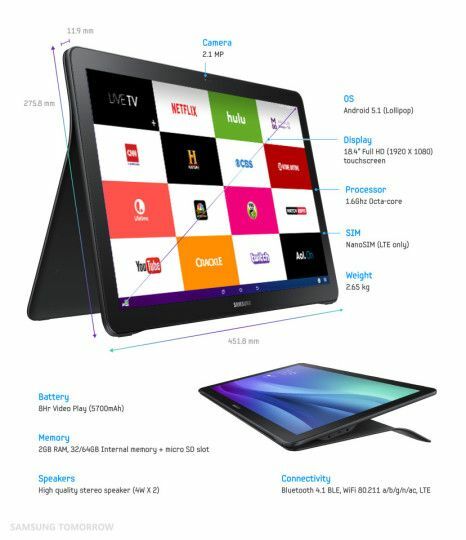 Weighing in at a chunky 2.65kg the Galaxy View measures 275.8mm x 11.9mm x 451.8 mm, it even has an integrated kickstand which effortlessly props up the device when users want to watch content from a distance. It’s powered by a 1.6Ghz octa-core processor with 2GB RAM and 32/64GB internal storage, runs Android 5.1 Lollipop, has a 2.1-megapixel front camera and supports LTE. There’s support for microSD cards and the 5,700mAh battery promises eight hours of video playback. Samsung has not yet confirmed when it will actually release the device, and even though a possible price was recently rumored, the company itself is yet to confirm just how much it will ask for the Galaxy View.